Vibrant colors, rustling silks, glistening accents, intricate tapestry-like motifs - rooted in tradition, dipped in regality – well, these are the rich Banarasi weaves. The ‘Khandaani’ Indian heirlooms preserved for generations, also known to have found mentions in the legendary texts of the Mahabharata, Banarasis represent a hallowed slice of our history - that continues to evolve. Famed for their luminous textures, magnificent brocades – with engravings-like effect - jewel hues, gorgeous zari highlights – dipped sumptuously in centuries of culture – the Benarasis are unmatched fabrics. Since they were initially crafted only on hand-looms - and truly the rare ones are only those that are hand-woven – they have come to be a mainstay of the Indian handlooms sector. The labour-intensive processes involved in weaving, and the use of high quality raw materials – coupled with special, secret weaving techniques - ensure that Benarasis are prized, exquisite weaves. Today, brocades and Banarasis are made with varieties of base materials and newly improvised ways, including using power-looms, bringing down the costs for the end customer – should one be willing to trade the new-age versions for the old-world charm of the hand-woven beauties. Famed for their characteristic opulence, these stunning creations get their name from the ancient Indian city of Varanasi or Banaras – where they have been primarily woven, since the last few centuries. Made in various fabrics – cotton, silk, organza, tissue, Kota Masuria and georgette, Banarasi weaves are primarily famous for the exquisite silk sarees with luxurious Zari borders. Not supposed to be taken lightly in an Indian household, cherished as the most popular traditional Indian wedding sarees, they are attributed great importance. There were times, when mothers (and grandmothers) used to collect rare Benarasi saris and brocades – from the time a daughter was born! Banarasi Sarees have acquired an iconic stature globally too. It’s an ethnic symbolism that has well and truly travelled the world. From international celebrities to political and style high brows, everyone seems to be enamored by this grandiose Indian statement. 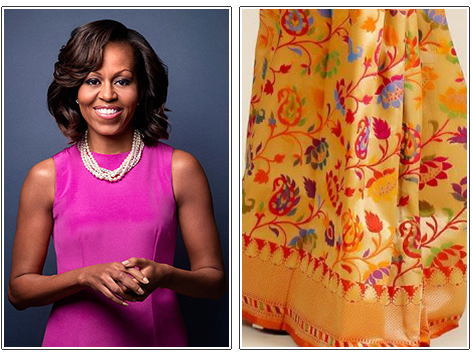 The reigning Indian Prime Minister Narendrabhai Modi (knowing Michelle Obama’s preference for the magnificent weave) had famously gifted a bespoke, hand-made Kadhua* Banarasi silk sari to the erstwhile first lady (of the US), on her visit to India. Rumors say that the total number of saris gifted was way higher, but let’s rest the matter there – taking pride in the majestic weave’s celebrated patrons and travels. As integral as they are to the Indian heritage, Benarasi Sarees are a non-negotiable part of the wedding trousseau - in most parts of India. Considered grandiose and auspicious, at least one Benarasi sari is worn by the bride, during the wedding functions. While for many North Indian and Bengali brides, this is their bridal saree – for others, this may be a reception sari or the one special drape they receive as gift from their in-laws – as shagun (the auspicious wedding gift). Apart from the cultural significance, plenty of class and economic symbolisms are associated with the extravagant yet classy Benarasis. Highly valued, known to have descended from the royalty, Banarasi brocades have time travelled many lands and centuries. The pure silk Banarasi fabric is known as the Katan silk; sarees in Katan silk are usually made without zari borders but with the softest and heaviest silk. They are prized for their splendid purity and sturdiness. Various types of brocading or designing may be done of this gorgeous fabric. Butis or scattered leaf/ floral motifs are quite popular – and are made in resham or zari – or in the Minakari designs. Expensive Banarasi Katan brocades are made using an extremely time & labour intensive technique. 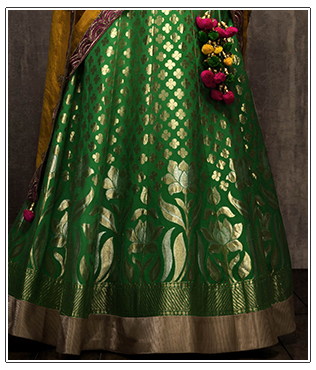 There also are Banarasee Organza saris, quite popular for their all-weather appeal and elegant look. Organza ones are also known as Kora silk Banarasis – they may or may not have Zari designs, buttis or borders. With contemporary times, Banrasee Georgettes have also gained prominence – they usually have resham work/ weaving. Cut-work, Tanchoi (a self-design sort of weave with no extra yarn on back or front – unlike brocades), Jamawar or Jamewar (mostly popular in shawls – or as saris that come with a matching shawl/wrap), Tissue and Kadiyal are other popular forms of Banarasee sarees/weaves. With changing fashion preferences, many brides tend to wear lehenga-choli for their D-day, but even then many are unable to get over the Banarasi fascination. Hence, the latest Benarasi Lehenga Choli trend! 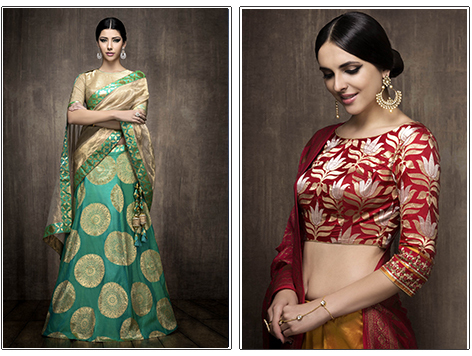 Made with magnificently woven fabric bases, these majestic lehengas are like works-of-art –their bases. Little or no ostentation may be added, and without much ado a stunning bridal ensemble can be created! Jangla, Tanchoi, Buttis, Ambi, Jhallar, Shikargah are the most popular Banarasee designs. Jasmine flowers, marigolds mango leaves (paisleys) and betel nut leaves are the much used inspirations for intricate motifs. Hazaar Panna or Thousand Emeralds is a classic heritage design, while the contemporary influences on the craft are manifest in form of chevron patterns, diagonal lines and more abstract impressions. The great city of Banaras is also called Varanasi – and Kashi - in religious scriptures. Famed as a popular Brocade Weaving Centre, it has a great cultural, religious and historical significance – where, once upon a time, Hindus specially came to take their final breath – to die. Because, it’s believed that the one who dies in this Godly city - attains salvation/ Moksha – thus, getting freed from the continual wheel of birth and death. The spiritual city of Banaras has fascinated Mughal rulers, Hindu saints, Sikh Gurus, Buddhist monks, music maestros and celebrated poets alike. Situated on the banks of the holy river Ganges, sacred, magnetic Kashi finds mentions in religious scriptures and even in Buddhist history – and thus, the Jataka tales. From here we get to know that it was also a popular trade and weaving center, in ancient times. The overall history of weaving in Benaras is somewhat broken. Buddhist records from Jataka Katha say that Kasi or Varanasi was a prominent cotton growing/weaving centre, though it was also reputed for all sorts of weaving. Some say the mentions and descriptions of Hiranya fabric – made of gold – as found in the revered Rig Veda are quite similar to those of the magnificent Kimkhab/ Kinkhab brocades of Banaras - which were woven with real gold and silver yarns. The city also finds place in Mahabharata. The British records, the most articulate of the available documentation, also corroborate the stand that the ancient city of Varanasi was always a significant weaving centre. Its remarkable brocades were even exported to Europe!. Even though historians record the distinctive sway of Rajasthani paintings as well as Hindu motifs on early brocades, it was noted that there was a sudden disappearance of ancient designs, somewhere around 16th century. Once popular for cotton and muslin weaving - the sacred atavistic center of generations of devout Hindu devotees, the land where Buddhism took its first baby-steps and an integral page in the history of Jainism – Benaras or Shiva’s own land Kashi – developed into a flourishing silk weaving cottage industry, as today, only at the turn of the 17th century. Brought to Kashi by Muslim weavers of Gujarat, following a famine - the prolific craft flourished bountifully here and continues to. Brocading that we see today has a distinct Persian, Mogul and Central Asian influence. Known to have been influenced from multiple foreign influences, improvised upon by myriad indigenous techniques, this fine weaving-style – now collectively called as Benarasi weave - had touched its pinnacle, during the Mughal era, when it was championed by the royalty and the nobility, largely under the patronage of Emperor Akbar. Persian, Turkish and Mogul influences are visible on Benarasi weaves. You can see them in the commonly used motifs of buttis, paisley, jhallar, bel and Shikargah (hunting). Today, one of the biggest cottage industries in the weaving sector in India, Banarasi handloom textiles weaving is spread around a number of cities, towns around Varanasi – in the state of Uttar Pradesh. A handloom Banarasi saree may take anywhere between a few days to few months for completion. The brocade weaving requires great skill and knowledge – and even then, the time and effort increase with the complexity in designs. The more elaborate weaves and brocades, thus, are more expensive. The weaver community of Banaras is – and has remained – under tremendous pressure – largely owing to economic reasons – as they fail to get the adequate remuneration for their back-breaking hard work. Authentic Banarasee saris use the purest of the silk yarns and zari. Zari is made from metallic yarns – which nowadays are largely synthetic. Pure Zari, as we know today, is made from copper yarns with gold and silver polish. Sarees with pure Zari are way more expensive than the ones made with new-age, synthetic variations. Accounts of use of real gold or silver yarns’ Zari in ancient times are available. Brocades – the shuttle woven fabrics with embossed or raised effect are stunning examples of human skill and creativity. Making them is certainly not an easy process, as along with the regular warp and weft yarns (needed for weaving any fabric), a third yarn is introduced, using a shuttle – and the designs are created, using punched cards. These days brocading is largely done on Jacquard looms. It may be done using resham yarn or Zari (metallic yarns). Kimkhab – the mysterious, sought-after brocade – is the name given to fabric with heavy brocading – done using over 60-65% of Zari. 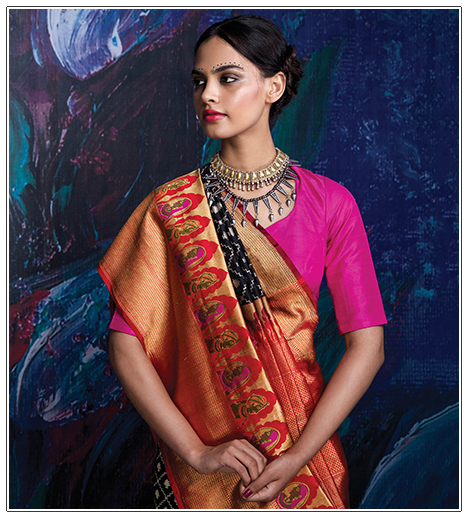 Kadhua Banarasi Brocade – discontinuous brocade, where each motif is individually woven by the weaver. There are no floating or extra weft yarns at the back of this material. An extremely labour and time intensive technique, this is one of the most difficult brocading techniques, requiring great handiwork and finesse. 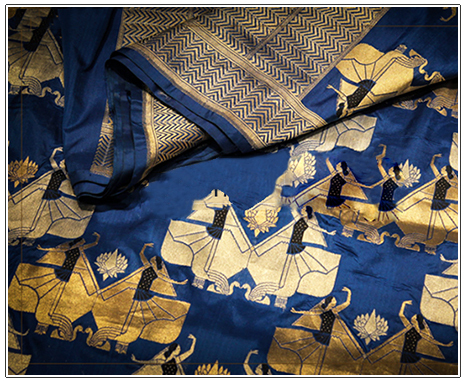 The popular weave of Bengal – Jamdani – is also made from a similar brocading process. Fekuan Banarasi Brocade – continuous brocade, where the motifs run from end to end of a stretch of base weave. Sometimes, especially when the motifs are not carried through the entire width of the fabric, there are loose (floating) yarns at the wrong side of the brocaded fabric. These yarns are usually cut off, before a material is pronounced finished. 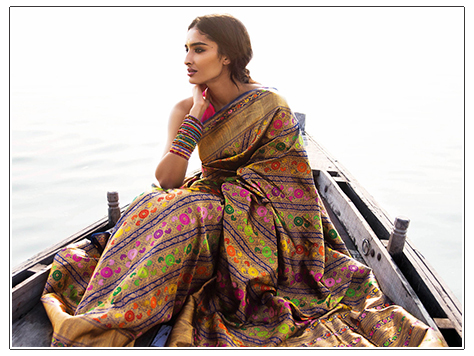 A hand-woven Banarasi saree is still considered the epitome of the sublime craft of Benarasi weaving. For starters, the concept of handlooms is deeply ingrained in the entire universe of the rich Indian weaves, including the Benarasis. This can be attributed to the times, when a regal queen seeking never-before, plush fabrics would sit with the couturier – and be involved in the fabric weaving from the yarn stage till when the final ensemble was produced. Mughal empress Noor Jehan is known to have a deep love for these tantalizing threads. With time, technological inventions and practical demands, though, power-looms invaded the world of handlooms. It is undeniable that use of power-looms reduces labor, costs, time, while enhancing the ease of availability. Also, brocades initially were made using an extremely labor-intensive, time-consuming process, specifically before the Jacquard looms were invented, which added to the costs and manufacturing time. This too has changed significantly – as with modern Jacquard looms a never-seen-before finesse and designing is possible. However, the mass production takes away the glory and uniqueness of the hand-crafted heritage saris. Plus, with the over-intervention of machines, makers also tend to cut corners on other accounts. Fake and low quality materials, uninventive designs, cheap imitations – without any intricacy, depth or sturdiness – and synthetic stuff, like Chinese Banarasis are great threats to this heritage weaving art. Speak to a connoisseur – and they will tell you how a fake or machine-made Benarasi will never match up to the ‘real’ Banarasi treasures.